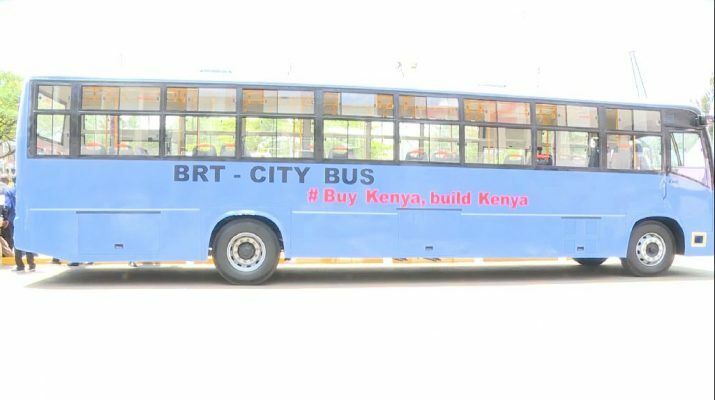 Isuzu EA Unveils Locally Assembled BRT Buses in Kenya – Kenyatta University TV (KUTV). All Rights Reserved. Isuzu East Africa (Isuzu EA) has today unveiled the first locally assembled high capacity buses that are specifically designed for the Bus Rapid Transport (BRT) system in Kenya. These buses come with enhanced body structures compliant to the Kenya Standard KS372, greater road stability and speed limits of 60 Kilometres per hour (km/h) for passenger safety and comfort. The high capacity buses will have a carrying capacity ranging from 62 to 100 seating and standing passengers. The three bus models unveiled were Isuzu FRR, designed for Feeder roads, the MV123 Stage coach, and the LV434 designed for Highways. Speaking today at the unveiling event of the BRT buses at their assembly plant on Mombasa Road, Isuzu EA Managing Director Rita Kavashe noted that the locally assembled buses are a demonstration to the Government, transport stakeholders and the public to show the readiness in supporting implementation of the BRT system. “Today we take this a notch higher and unveil three locally assembled bus models to support the BRT system with a capacity for up to 100 passengers,” said Kavashe. “This is a clear demonstration of Isuzu’s local capability in supporting the implementation of BRT solutions for the country to help ease traffic congestion on our roads,” added Kavashe. Kavashe similarly mentioned the need for Government and transport stakeholders to turn to local vehicle assembly companies in providing sustainable local solutions for the country’s transport needs. Kavashe further explained that Isuzu EA will continue to engage with Government and other relevant stakeholders to seek innovative transport solutions for the country. “This achievement was made possible through various partnerships with local stakeholders in the transport sector. Many thanks to our partners in the banking sector who have confirmed their financial support in the purchase of these buses and our accredited body builders,” added Kavashe. Nairobi Bus Transporters Chairman Edwin Mukabana expressed his delight on the achievement of a locally assembled BRT buses noting that this will make the buses affordable and readily available. “I am happy today to see a local assembly company being able to provide a local solution to our transport needs,” said Mukabana. “Importing fully built BRT buses for this market makes it expensive and difficult for PSV operators to purchase the vehicles. However, with locally assembled high capacity buses, the cost will significantly reduce and the buses will be available much faster for deployment,” added Mukabana. BRT is a bus-based public transport system designed to improve capacity and reliability relative to a conventional bus system. The first BRT system was the integrated transportation network in Brazil which entered service in 1974 and since then a total of 166 cities in six continents have implemented the BRT system.